LAKE FOREST, Ill. - The Lake Forest College women’s hockey team dropped a 4-2 decision at home to UW-Stevens Point, the nation’s seventh-ranked team, Tuesday (December 5) night. The Foresters fell to 5-1-3 overall and 2-1-2 in Northern Collegiate Hockey Association play. The Pointers raised their overall record to 7-2-1 and their NCHA mark to 2-2-1. The Foresters took the early lead on a shorthanded goal by junior Courtney DeHoey (Chatham, Ont./Bluewater Jr. Hawks) at the 7:22 mark of the first period. 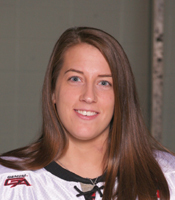 Classmate Laura Wilson (Corunna, Ont./Sarnia Sting) assisted on DeHoey’s team-high ninth goal of the season. Stevens Point converted that same power play opportunity just 23 seconds later to tie the score and took the lead with a shorthanded goal of its own at 11:52. Lake Forest tied the score again on a power play goal by freshman Courtney Bean (Peoria, Ill./Team Illinois) at the 4:19 mark of the second stanza. Bean’s first career goal was assisted by junior Jen Clouthier (Aurora, Ill./Chicago Mission) and freshman Brita Irving (Fairbanks, Alaska/Team Alaska). The Pointers, however, regained the lead with four minutes remaining in the period. The visitors added another power play goal at 11:44 in the third period to close out the scoring. The Foresters will return to the ice the first weekend (January 5-6) of 2007. They will play at St. Mary’s University at 7:00 Friday night and again at 2:00 the following afternoon.